For those who want to add an extra dimension of appeal and some decorative flair to their walls, then the traditional options of whole wallpapering or painting may not be the most effective solution. Many are choosing to add wall panels beneath the chair line that host a look all their own and add a sense of texture and permeance to the walls. Amongst the options available are the Lincrusta dado panels. There are a variety of panels, each with their own design and specific look, but all of them bring something quintessentially classic to the home. While many like the feeling of period design to the home, and the act of imbuing the home with a sense of history and luxury, you have to be careful when choosing a time period. Compared to the heavier, more “serious” tone of Victorian design, Edwardian Dado panels are comparatively light. They have the look of luxury and timelessness you want, but an informative, almost playful design to them that ensures the home still feels welcoming and fresh. Perhaps you want something that feels a little trendier and more immediately accessible? Then the Art Nouveau panels might be for you, evocative of the iconic designs of Charles Rennie Mackintosh. For a dramatic Renaissance look and a touch of European flair, the Spanish-inspired embossed leather look of the Seville panels might be a better fit for your home. For those that prefer the beauty of the arches and ecclesiastic tracery of older European churches like Notre Dame, the Gothic style lifts inspiration directly from the architectural style. Dado Panels lift inspiration and design elements directly from different art and architectural movements across history, bringing them into the home. Though a great deal of the appeal of Dado panels lies in their ability to transport some of the most aesthetically appealing and impactful designs from across the centuries right into your home, they are a practical choice, too. Attention to detail and quality of material goes into creating these flexible, sturdy wooden panels that can be added anywhere in the home. While they are commonly added to the chair line of the wall, adding a sense of dimension and craft, they can also be fitted to stairs, sloping walls, and even around sunroofs and doors. Where you choose to install the panels is up to you. Although Lincrusta dado panels take a lot of effort and inspiration to design, they are not difficult to incorporate into the home. These panels come with an ease of application that allows you to immediately start adding that extra layer of design to your home as soon as they are delivered. 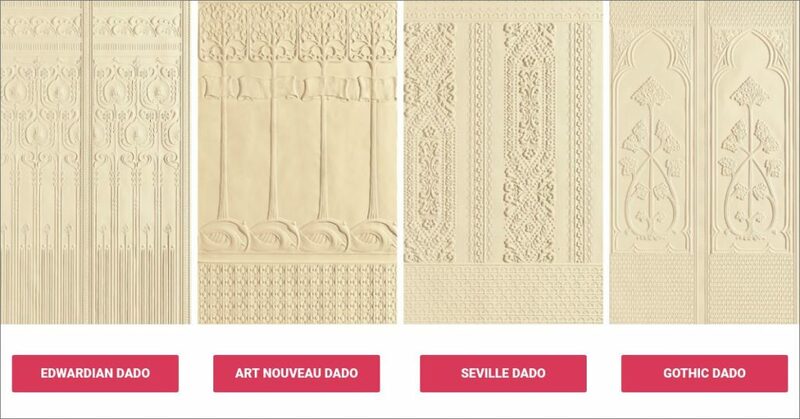 The Lincrusta Dado Panel range can help add the prestige and unique appeal of several of the biggest and most appealing art and architecture movements right into the home. Add a sense of timelessness and history to your home and consider making your walls more than just four sides of a room. Lincrusta is a very specialist kind of wall covering. As a result, you should not try to install Lincrusta for yourself; you will need a reliable, experienced Lincrusta installer such as us at Highly Decorated. We can ensure that Lincrusta is always installed correctly, guaranteeing the best finished product and ensuring longevity. If you have fallen in love with the delicate designs of Lincrusta borders and friezes, Lincrusta patters or dado panels, get in touch to arrange an installation. Having worked with many satisfied customers, we know that you won’t be disappointed by your choice.